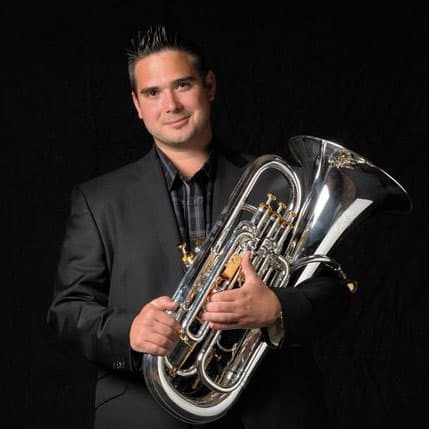 Alliance Artist David Childs will join the faculty of the College of Music at University of North Texas as a Professor of Euphonium in August 2018. UNT is based in Denton, Texas. David will be taking over from renowned euphonium soloist and teacher Dr Brian Bowman, who has been teaching at UNT since 1999. A proud product of the British brass band movement David has performed with many of the world’s premiere brass bands including Brighouse & Rastrick, Black Dyke and Cory with whom he was principal euphonium for ten years. He is a founder member of the highly successful brass quartet Eminence Brass and Artistic Director of Wales’ premiere wind orchestra Cardiff Symphonic Winds. As a conductor he has recently lead Flowers Band, a brass band based in Gloucestershire, to a world top twenty position. David is undoubtedly leading the way for euphonium players worldwide. Through his own performances he continues to showcase the euphonium as a serious solo vehicle within the world of classical music. His distinctive euphonium mouthpieces are popular all over the world. For further information, visit www.davechilds.com.